We focus a lot on the ambitions and intelligence. While both these traits are important ingredients of success, we cannot ignore the character/culture of the person/organization. Lack of strong character will always push the smartest guys towards fraudulent activities. Problem with analysts is that they would analyze companies showing high fluctuation in earnings with great detail but would not bother to dig deeper into companies showing steady growth in profits. The smartest guys at Enron took advantage of this and posted steady growth in earnings over the years with no eyebrows raised. Intelligence is of no use without experience. 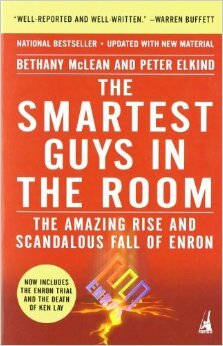 Enron had developed a culture where intelligent people were preferred over experienced ones. Compensation structure in organizations should focus on delivery of product/service. Without delivery, no compensation/bonuses should be paid upfront. Every new management tries to come up with new processes/business models/strategies/markets and try to prove themselves by disposing off the old systems, no matter how profitable the old business was. There are two type of people, the risk takers and the risk averse. Risk takers should be the business drivers while the risk averse people are better suited to be a part of risk management department. If you put a risk taker as in-charge of risk management department, you can reasonably expect the risk slippages in the system. For some business models to work, you need a long history of operations in that business. If you invest in those businesses without a proven track record, there is no way you can get consumers to switch. Utilities industry is an example. One of the most important factors one misses during financial analysis is the revenue recognition policy of a company. It is just a half page note that we miss because we think it is always generic. Well it is not! Take an example of financials of Wateen Telecom in Pakistan. I have presented some of their policies here. A member of top management suddenly leaving his/her position without any reasonable explanation is a big red flag. When reading financial statements, try to assess how much focus the management puts on share price. Try to judge how important the share price of their company is for them. Look for share option based compensation packages.